This dish might truly surprise you. I never thought that one could get such a bursting flavor and such a lovely texture from pearl barley. The idea came from a British cooking class I took in London couple of weeks ago. I'm saying "risotto" here to refer to the technology of cooking a grain, which makes it creamy, and I don't mean to heart anyone. Anyhow my risotto loving family said this one totally counts. Like many Russians I never had any particularly warm feelings towards pearl barley. That's because my first acquaintance with this grain happened in my Soviet Union kindergarten. 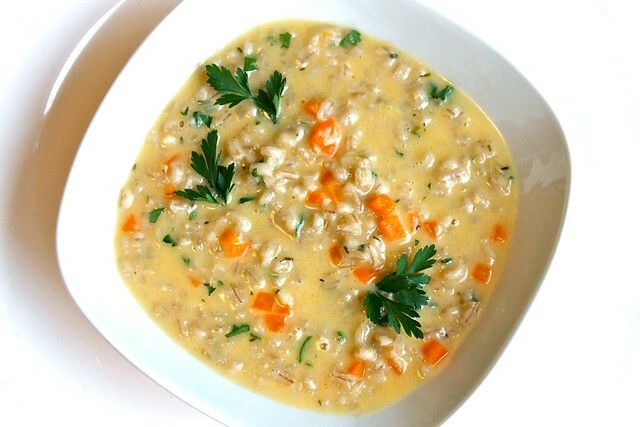 Pearl barley is not potato in a sense that how you cook it really matters. Later on I learned to handle it much better than my kindergarten kitchen managed, but still I never got anything special out of it. One of the things I did in London though was a British cooking class at L'Atelier des Chefs cooking school. I loved the whole menu of the class. 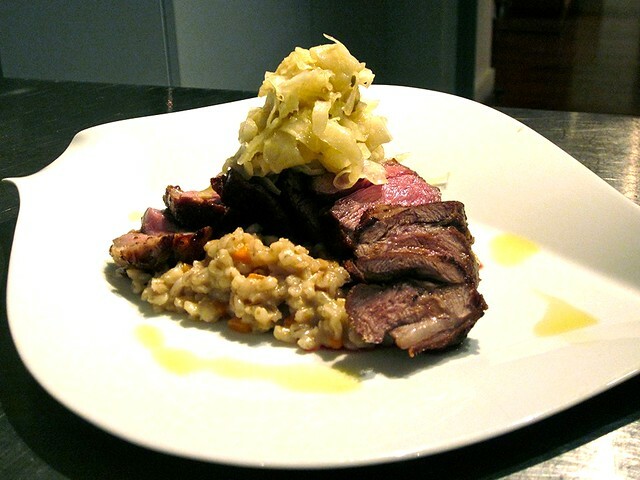 We made pea & mint cream soup with garlic croutons, seared rump of lamb garnished with pickled fennel and pearl barley risotto plus amazing Roly-Poly for dessert. I don't know how traditional this kind of risotto actually is for Britain. It might partially come from the past and partially be part of the newest trends in British cooking, which definitely benefits from international gastronomy and closely looks at using wider range of alternative healthy or locally grown products. I tweaked it somewhat to make it even more British by using cheddar cheese I got in Harrod's instead of parmesan and adding caramelized leeks and I'm pretty happy with how it came out. It is even less labor intense than the rice risotto. Pearl barley is very starchy, so there is no need in adding stock ladle by ladle. You can just pour it in all at once and let the barley cook. Occasional stirring is enough to produce the creamy texture at the end. Flavorful stock really matters for this dish. If you have some (vegetable, chicken or even mushroom) use it here. If you don't have any stock, just make it while preparing the ingredients for risotto. It works easily and beautifully and lets you wisely use all your vegetable trimmings. Pick a large heavy bottom pan at least 6 cm deep. Set it over medium heat and add two table spoons of olive oil. Add the leeks (if using) and cook for around 5 minutes stirring till they soften and begin to brown. Transfer the leeks to a plate and set aside. Heat two more table spoons of olive oil in the pan. Add the garlic, shallots and carrots and cook for around 5 minutes stirring from time to time till they soften. Add the thyme and cook for another minute. Drain, rinse and drain again the pearl barley. Add it to the pan and cook stirring for 2-3 minutes, till it gets covered with oil. Pour in the hot stock, add salt and pepper, stir and bring back to boil. Cook on medium heat without lid for 15 - 17 minutes stirring from time to time. When the stock is almost fully absorbed, add the butter and grated cheese. Take off the heat and stir well, till all the butter and cheese melts and the risotto whitens. Taste and add salt and pepper if necessary. Stir in half of the parsley. Serve immediately garnished with caramelized leeks and sprinkled with the rest of the parsley. Place onions and carrots in a medium heavy based pan and set it over high heat (do not add oil). Cook till the veggies slightly brown on the outside. Add the rest of the ingredients. Pour in 700 ml (just below 3 cups) of water, bring to the boil. Cover with a lid and cook on low heat for 30 minutes - one hour (the longer the better). Strain.